Historic Bridge Park, located a bit southeast of Battle Creek in Calhoun County, Michigan, is a unique park which also functions as an open air museum whose focus is on the historic truss bridges that have been moved to and restored within the park. The park allows metal truss bridges that have become insufficient for their original location to be preserved for their historic and aesthetic value. There also is a historic stone arch railroad overpass within the park. Historic Bridge Park is the first of its kind in the entire United States. 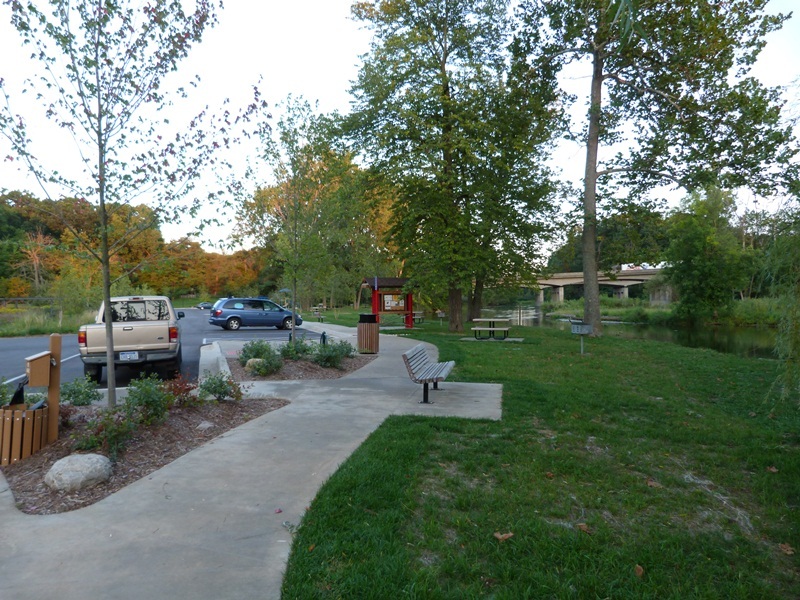 In addition to providing the historic bridges for the enjoyment of visitors, Historic Bridge Park is a fully functional park, with running water restroom facilities, picnic and playground areas, and paved trails for the enjoyment of pedestrians, bicyclists, etc. The park is only four-five minutes from Firekeepers Casino. Entry into the park is free of charge, and the park is open year-round from 8:00 AM to 8:00 PM. 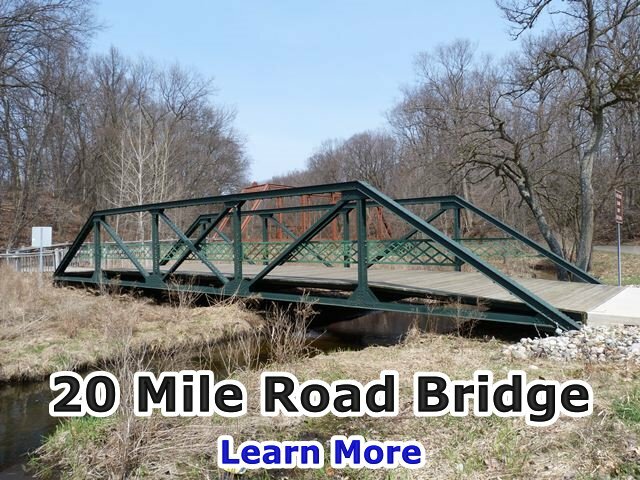 If you are new to the world of metal truss bridges, such as those featured at Historic Bridge Park, you might find viewing the Introduction to Historic Bridges presentation to be helpful. 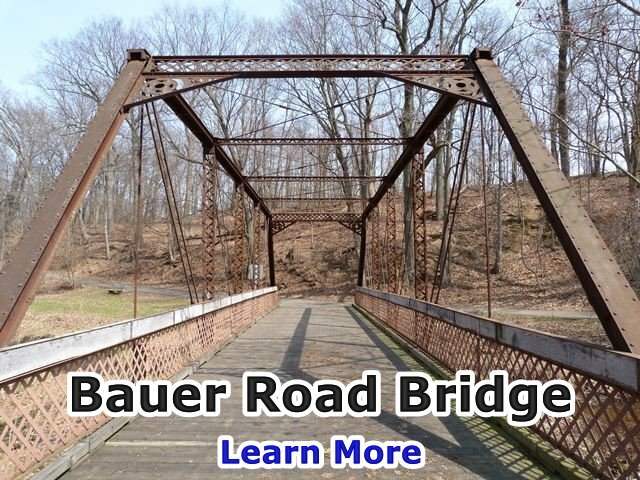 The restoration of the metal truss bridges in the park was directed by Vern Mesler with the support of Dennis Randolph, former Managing Director of what was then called the Calhoun County Road Commission. 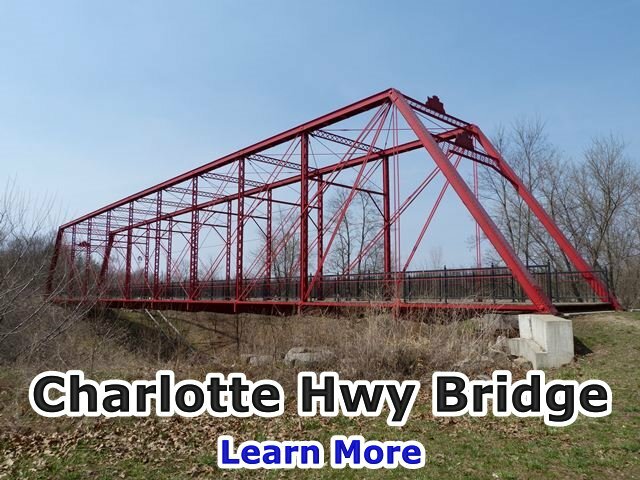 They carried out the restoration with an unprecedented attention paid to maintaining as much of the the original bridge material as possible, and exactly replicating any parts that required replacement. For example, during restoration, failed rivets on the bridges were replaced with rivets, not modern high strength bolts. 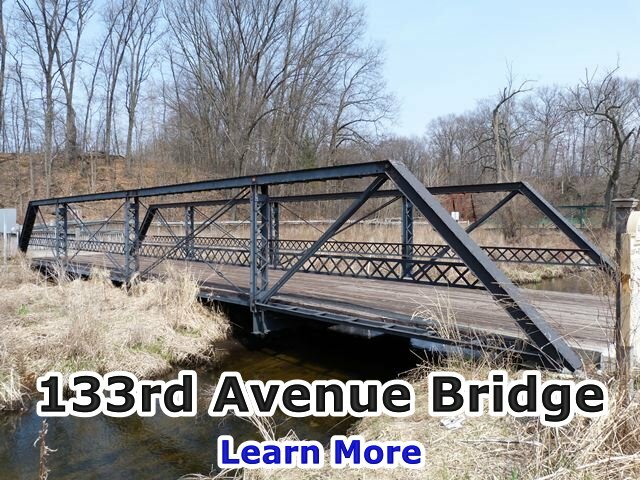 The bridges in Historic Bridge Park represent some of the best metal truss bridge restoration work to be found in the country. 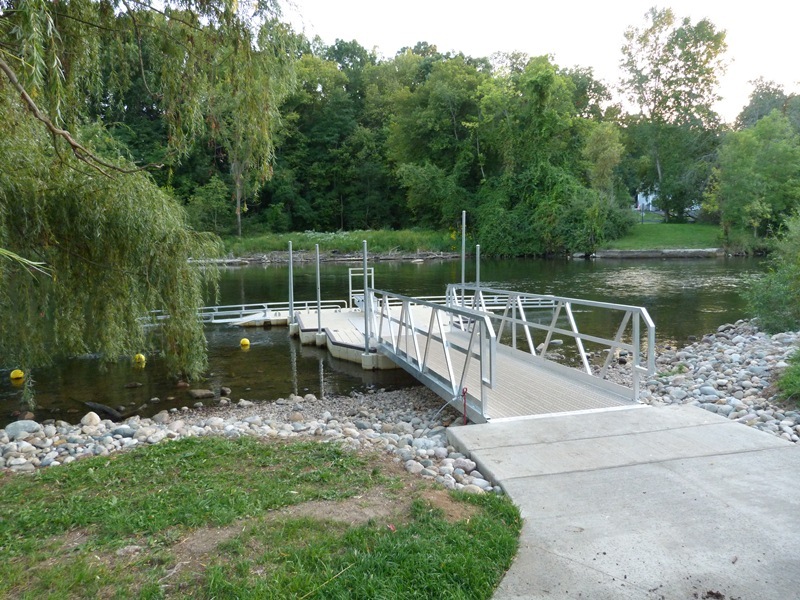 After being closed for over a year due to an oil spill due to a broken Enbridge pipeline upstream from the park, Historic Bridge Park reopened on June 5, 2012, following cleanup. 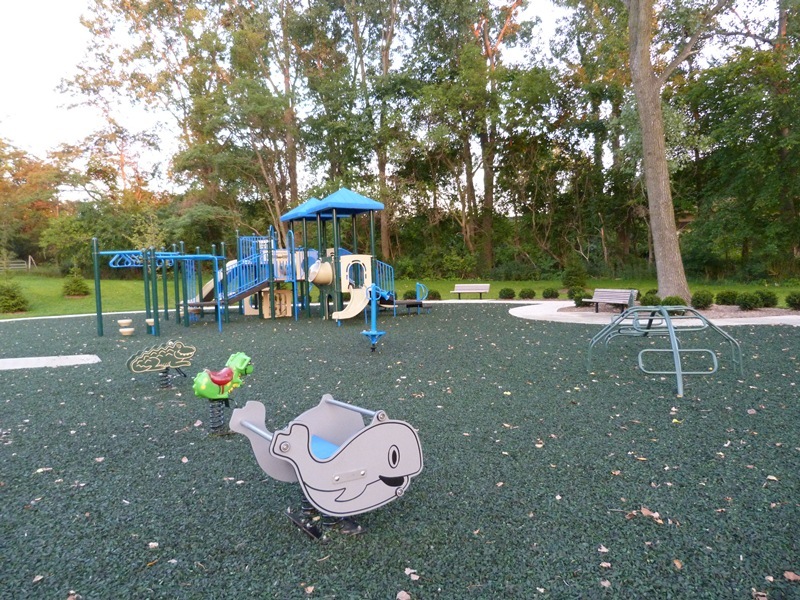 In an effort to give back to the community that it has damaged and inconvenienced so extensively, Enbridge also paid for improvements to Historic Bridge Park that included improved restroom facilities, parking lots, and a new playground. An improved stairway up to the Charlotte Highway Bridge is also present. 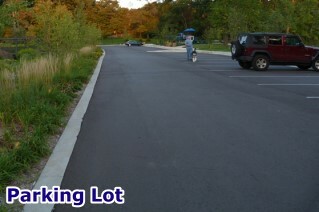 Enbridge also provided an endowment to provide for the maintenance of these new park features. Today, visitors can enjoy a greatly improved Historic Bridge Park. There are currently five metal truss bridges and a stone arch bridge for a total of six bridges at the park available for the public to view and experience. All bridges are open to non-motorized traffic only. All bridges in the park have their own Bridge Browser page on HistoricBridges.org, complete with historical information and numerous photos of the bridges. 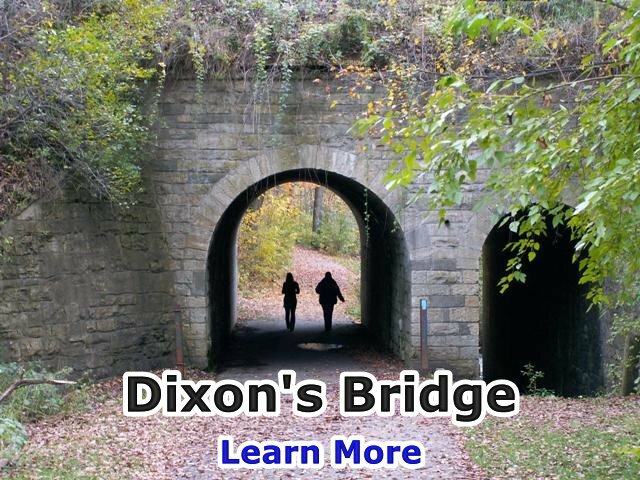 Click the photos below to view the individual webpages for the bridges featured in the park. 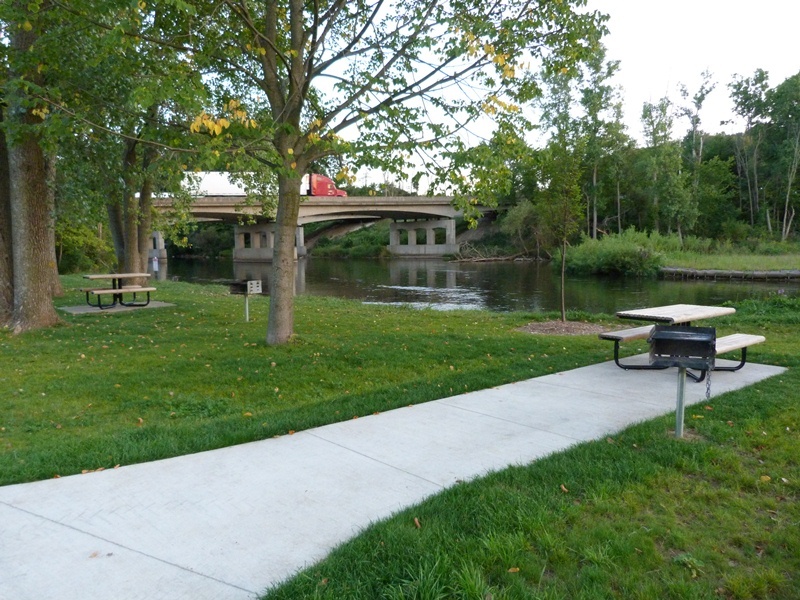 In addition to housing the fascinating historic bridges, Historic Bridge Park also has many amenities that visitors expect of a full-featured park. 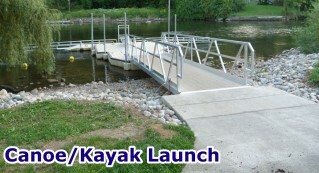 A boat launch is available to access the Kalamazoo River, including a launch for canoes and kayaks. A picnic area with grills is available. There is also a playground. 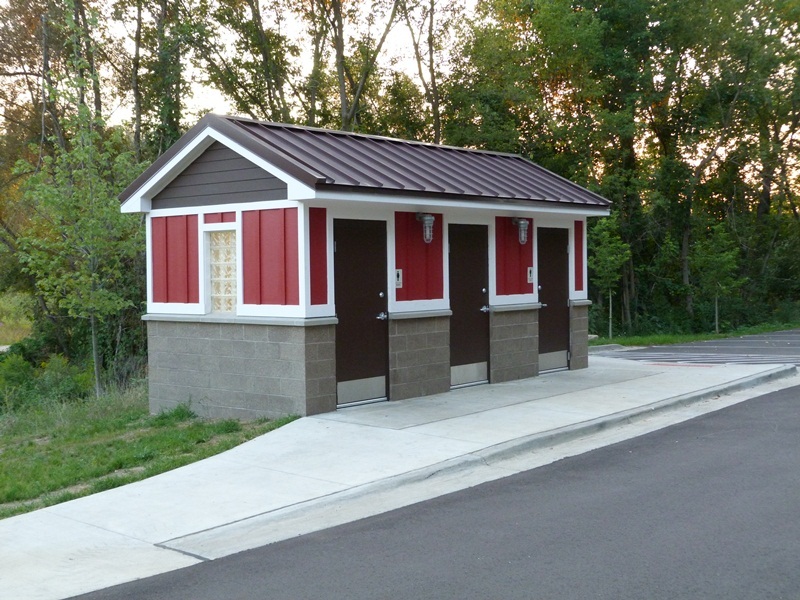 Running water restroom facilities have been installed in the park. The North Country Trail passes through the park. 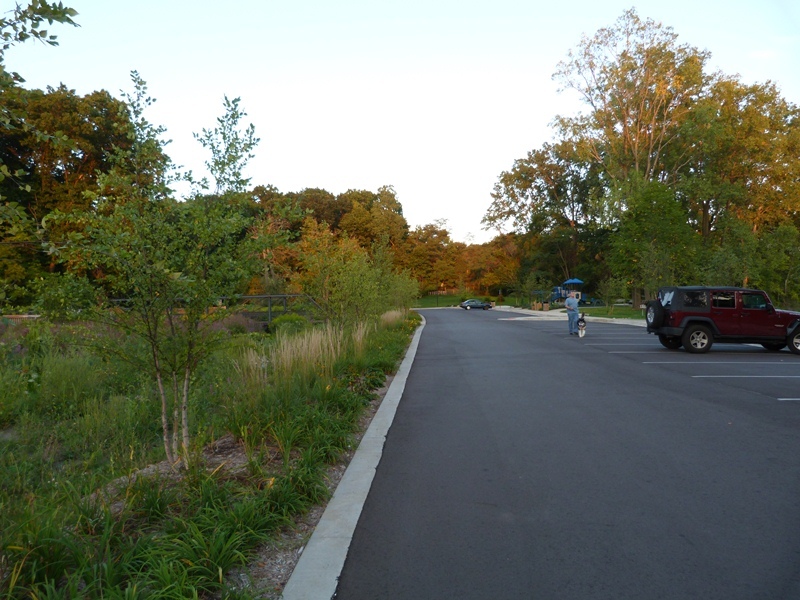 The paved path that connects the bridges in the park is open to all non-motorized forms of traffic, such as walking, biking etc. 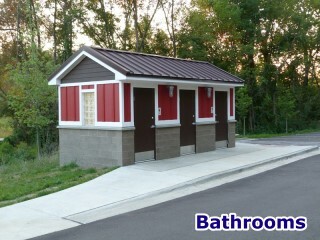 A pavilion is present in the park and can be rented for special events. Historic Bridge Park would be a great place to have a wedding, birthday, family reunion, or other special event! If you want to reserve the pavilion for a special event (fee applies) or have other questions related to holding a special event at the park, contact the Calhoun County Park Department at 269-781-0784, or email msue.calhoun@county.msu.edu. Driving on I-94 Westbound, take Exit 104 which is 11 Mile Road. Do not turn at the first intersection, and instead go straight. The short road will end at Michigan Avenue (M-96). Turn Right (west). Follow Michigan Avenue (M-96) west until you reach Wattles Road (has a stoplight) and turn left (south). Follow Wattles Road, cross the railroad tracks and turn left at the drive with the Historic Bridge Park sign. Alternate Route from Westbound I-94: Driving on I-94 Westbound, take Exit 104 which is 11 Mile Road. Turn left (south) from the off ramp to proceed south on 11 Mile Road. Drive on 11 Mile Road for 3/4 mile, going straight past Michigan Avenue (I-94 BL / M-96) and turn right (west) onto F Drive North. Follow the road until it ends. Turn left (south) onto Wattles Road, cross the railroad tracks and look and turn left (south) again at the drive with the Historic Bridge Park sign. Note: F Drive North was hit hard by the winter of 2013-2014 and as of 2014 was filled with many potholes. Driving on Eastbound I-94, take Exit 100 which is Beadle Lake Road. Turn right (south) onto Beadle Lake Road and then take an immediate left (east) onto E Drive North. Follow E Drive North until it ends at 9 Mile Road (Wattles Road) and then turn left (north). 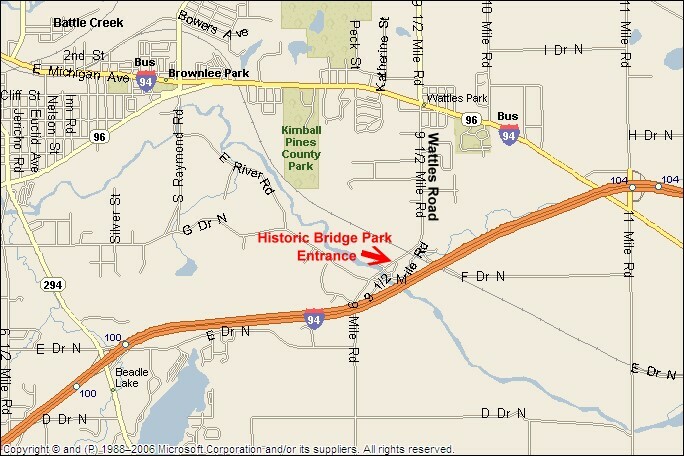 Drive under I-94 and over the Kalamazoo River and then turn right (south) onto the drive with the the Historic Bridge Park sign. Alternate Routes from Eastbound I-94: Take Exit 104, and Turn Left onto 11 Mile Road. Then, turn right onto Michigan Avenue (M-96). Follow Michigan Avenue (M-96) west until you reach Wattles Road (has a stoplight) and turn left (south). Follow Wattles Road, cross the railroad tracks and turn left at the drive with the Historic Bridge Park sign. Alternatively, instead of turning right onto Michigan Avenue, you can also stay straight on 11 Mile Road for 3/4 mile, going straight past Michigan Avenue (I-94 BL / M-96) and turn right (west) onto F Drive North. Follow the road until it ends. Turn left (south) onto Wattles Road, cross the railroad tracks and look and turn left (south) again at the drive with the Historic Bridge Park sign. Note: F Drive North was hit hard by the winter of 2013-2014 and as of 2014 was filled with many potholes. 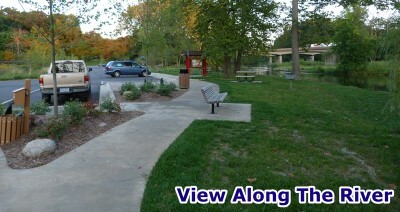 Click the below thumbnail to load a road map showing the location of the park. 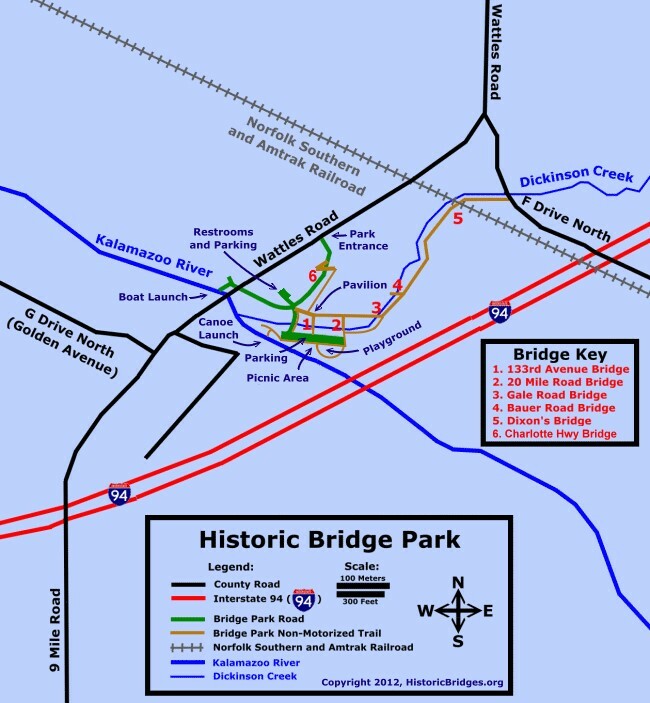 The map below is a park map shows the location of park features, as well as the location and names of all historic bridges in the park. If the text is not legible, please click/tap the image to download it to your computer for printing or viewing outside your browser. HistoricBridges.org has prepared a guide that can be printed out and taken on a visit to Historic Bridge Park. It includes brief information about each bridge in the park, as well as a map of the park area and directions to get there. 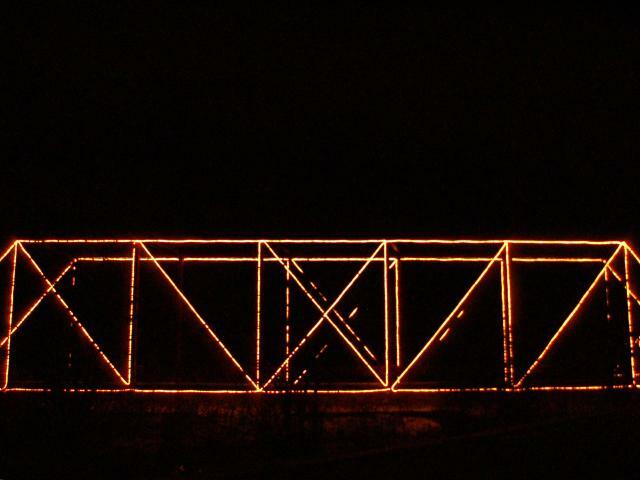 For several years, from roughly Thanksgiving through New Years, the bridge park had an an attractive light display where the truss bridges had lights strung on their members and chords to create a fun and interesting experience. Unfortunately, loss of funding has led to this event becoming a thing of the past. However a photo gallery of the truss bridges with lights on them is available here. 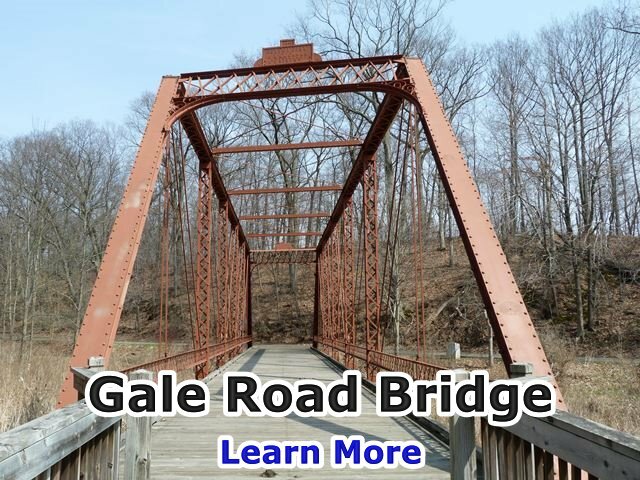 Below is the official Calhoun County page for Historic Bridge Park as well as the official page for Vern Mesler's historic bridge related work including the restoration of the bridges in the park.